This seemed to be a really easy sketch, but appearances can be deceiving. The head of the man was tilted somewhat towards his neck, while I had drawn it straight. His suit was alright, though. 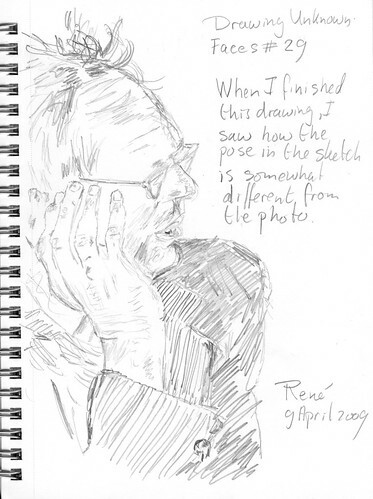 This sketch is based on a photo grabbed from the Flickr public photo stream. I used squinting of the eyes when looking at the reference photo, to avoid being distracted by those big poppers, aka eyes, in this woman’s face. I haven’t yet reached a level where I can avoid the trap of drawing things instead of lines, but slowly I’m getting there. It’s interesting to see how my mind seems to work. I wonder if more people have this tendency of seeing eyes where there are in fact only pixels on a computer screen. It requires some discipline to see the lines of the eyes, instead of that “pre-programmed” idea of how eyes should look like. Seconds after I had finished the sketch, I thought the face I had drawn was rather ugly. However, now I’m writing this blog post, I can see the striking similarities with the original photo. It’s only off by 5 percent or so. Still, that is enough for my acute sense of likeness to spot the obvious traces of “Cyloness” (reference to the second TV hit series Battlestar Galactica), although, I believe Cylons were exact replicas of humans, only with an artificially programmed brain. Ah well, as long as it is fun drawing faces of people I don’t know and probably will never meet in life, it is all swell, I guess. I only wished I was just a little bit better at drawing. Who knows, after another 100 sketches I will look back at this sketch and think what I was thinking to put that ugly mug on the Internet. 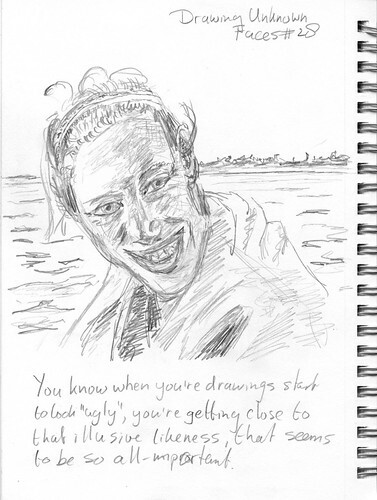 The sketch is based on a photo I grabbed from the Flickr public photo stream. I have no intention of making money with it, so I published it with a Creative Commons license, so others can use it if they want to. I can’t imagine why, but there you have it. I had to have another go at this drawing of children. Those cute eyes are so, well cute, that my eyes are drawn to them, no matter what. So I tend to draw them too big, or overcompensate by drawing them too small. I tried another approach, by squinting my eyes and look where the overall locations of the shapes were. This also seems to suppress the inborn tendency for seeing cuteness instead of what’s really to be seen. This worked much better than drawing with open eyes the whole session. Of course, there were obligatory mistakes, like the forehead not tall enough and the chin too close to the nose. Those are easy to correct, though. 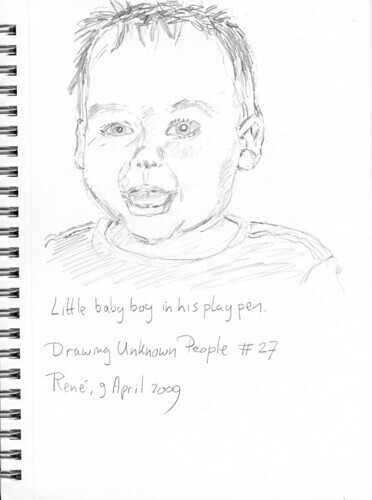 This sketch is based on a photo grabbed from the Flickr public timeline. I wrote this little rant on TWiT Army Canteen. It is nothing new, just something to get out of my system after a recent bad experience with a closed community. I’ve edited the text a little bit compared to the series of 140-character long micro-blogging messages (called mu’s) I originally wrote my rant in. I don’t mention the name of this closed community, because I don’t want lower myself to throwing mud and dissing people. I’m also not full of grudge, certainly not after I’ve put my thoughts in a blog post and don’t have to think about it anymore. If people are happy in their closed little world, let them be happy. I just don’t want to be part of that world. I’d rather be on the World Wide Web, where ideas roam freely and I can learn new things, even while hitting myself on the forehead now and then, because I made another stupid mistake in how I worded my sentences. Although it may not seem like it to some and some of the times, I always try to be sincere and honest, and to respect other human beings. My idea is that I will be get the same in return, most of the times. At least, I learn to sharpen my social skills when communication goes awry and personalities do collide. Anything that doesn’t kill me can only make me better. I think there is value in having an open community, as opposed to a closed (hidden) community, even outweighing negatives of pesky spambots. The few closed online communities I’ve been part of were all kind of xenophobic and close-minded, dissing new users with new ideas as a rite of passage. The idea behind a decision to keep a community closed is often to gather the elite, but those hardly are attracted to those communities. After some time, your closed community tends to fill up with socially inept people, who can’t deal with the realities of life in the open. You really need an influx of new people and new ideas, keeping your community fresh and alive. The regulars should never become all-powerful.That is why your community should be open and the procedure to join should be almost invisible and instantaneous. I know I’m a regular in this community [TWiT Army Canteen], and that I should try to stay as open and receptive to change as new users often are.